When you add a reader as a resource, you are inserting a reference to a dataset to be used in the workspace. This reader will not perform any actual data reading, except when up-to-date schema is required at runtime. When required, schema may be requested from that reader. Currently, this option is only used by the writers that are configured to use Dynamic Schema Definition. In the dynamic mode, a writer will extract schema information from one or more of the specified readers or reader resources to use during a translation. This feature is particularly useful when a writer needs to get the schema and features from several different datasets. The difference between a Reader and a Reader Resource is that adding a Reader will also add all the associated feature types – a reader resource can be used as a source for schema without actually providing any feature types. The process in Workbench is similar to adding a workspace Reader. 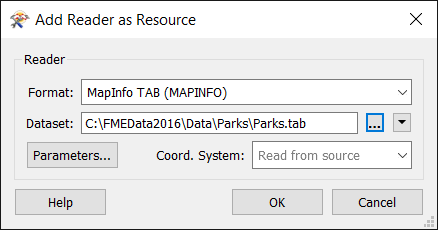 You will need to select the dataset file (or group of files) that you want to add as a resource (FME can usually determine the format from the file extension, and will automatically populate the Format field). If required, specify any additional format parameters. After you click OK, the log file will display the processing statistics associated with the selected dataset, and you will see a Translation SUCCESSFUL message, indicating that Workbench has successfully processed the dataset. This Reader will remain in the list as a resource of the workspace. When you want to use the schema from a reader, open the Writer Feature Type dialog, and check the Dynamic Schema Definition box. Schema Sources: Click the Browse button to select from a list of existing schema readers. Only the readers that you have selected will be used at runtime. If Schema from Schema feature is selected, the schema of the first feature to reach the writer is used. This option is useful if your workspace produces a user-defined feature that may not contain any actual data, but contains useful schema information. For more information, see Deriving Destination Schema from Schema Feature. Schema Definition Name: Defines how elements in the schema definition of the feature type are named. By default, schema elements are named based on the feature type name, under General Parameters. Alternatively, you can name schema elements based on a specified attribute. Attributes to Remove: This option allows you to remove attributes from the feature. Click the ellipsis (...) and enter the names of any attributes you do not want in the destination feature (for example, OBJECTID, SHAPE_Area, and any others).